I decided to get an accessory outlet for my bike. I am sick of going through batteries in my GPS and need to carry less batteries for my video camera. It needed to be interchangeable with both my V-Star and my ZR-7S (ZR750H) and be weather resistant, I do a lot of riding in the rain. Here is how I did it, from beginning to end . . . I searched on eBay and got this one for $14.99. I like it because it has a rubber cover for when I am not using it. It also comes with a cigarette lighter, the kind you push in and it heats up. I don’t smoke but you never know it could come in handy. Three days later it showed up at my work. It is a pretty easy installation, my ZR-7S has accessory leads coming from the junction box while my V-Star does not. I will explain how to hook up the outlet on both systems. First the ZR-7S. . . Since the ZR-7S has accessory leads coming from the junction box, there was no need to access the battery terminals. All you have to do is remove the seat and find the two leads coming from the junction box not hooked to anything. One will be white and blue, that is the positive lead. The shorter black and yellow lead is the negative lead. Since my electrical connectors do not fit the stock Kawasaki ones, I snipped them off and replaced them with my own by crimping the quick-disconnect terminals to the wires. This way I can easily remove the outlet and move it to my other bike. I used blue terminals and black wire for negative polarity and red terminals and red wire for positive. I also made sure that even color blind people wouldn’t reverse the wires. I used a male connector on the positive lead from the junction box and a female for the negative lead. Once done with the leads from the junction box I snipped the ends off of the supplied wires and fitted the quick-disconnect terminals onto them and crimped them to keep the wire secure. I wound the wires along the frame to under the pillion seat. You can use ties but I need to be able to remove it quickly so I did not. Before hooking up the outlet to the battery, I covered the exposed metal of the accessory outlet with elecrtical tape to minimize the chance of shorts. Hook up the red wire to the center fitting and the black negative/ground to the fitting on the outer shell. The supplied positive wire has an inline 10 amp fuse, which will burn out to keep your expensive elctronics alive. The ZR-7S also has a 15 amp fuse for the accessory circut. In this case we have a redundant fuse, which is fine since the V-Star does not have an accessory circut and needs the inline fuse. I plugged in the GPS cord and the LED in the plug came on. I was a bit perplexed since I expected the circut to be dead when the key was in the “OFF” position but the accessory circut is always on. Something to remember before leaving your bike overnight, shut down your gadgets, or better yet, unplug them. OK, now the hard part. How to get the power from the rear of the motorcycle to the handlebars? My GPS power cord is about 6-7 feet long. I wound it along the frame to the main wiring harness that supplies power to the lights, meters, and everything else up front. The best way would be to remove the tank, but I found you can stick your hand in enough to wrap the wire around the harness to give it enough clearence from the heat eminating from the engine. Once to the front of the tank I followed the clutch cable and turn signal wires through the bracket and up to the GPS held to the handlebars by a RAM mount. My V-Star was not set up with accessory leads so you have to connect the outlet directly to the battery. You will need to remove the both seats, the left side battery cover, and the lockable compartment cover. Once those are out of the way you can unhook the rubber retaining band around the battery. This will allow you to access both battery terminals. I crimped two “spade” connectors onto two wires, a red one for the positive lead and a black one for the negative/ground and attached them to the battery leads. I taped the two wires together and wound them under and in front of the rear shock. I attached the quick-disconnect terminals to the ends of these wires to hook up with the accessory outlet. I chose to put the outlet in the lockable compartment to give it some protection and so I didn’t have to mount it where it would be hard to remove. From this point on it is the same as the installation for the ZR-7S, wind the power cord under the tank with the main wiring harness up to the handlebars and the RAM mounted GPS. Now you can go wherever without worrying about batteries. The 10 amp fuse is fine for just about all electronics, but you might have a problem with electric items like a blender or iron. I know, wrinkle-free shirts and margaritas are something you will just have to go without while on your motorcycle trips but sacrafice is good for you. All the materials, including the outlet, the connectors, and wire stripper/crimper, cost me less than $30. If you have any comments or tricks to make this project better, let me know. Last week I rode my new ZR-7 into work and all was good. The weather, the feel of the bike, I was in a groove. After work I walked to my bike and started it up. It idled rough but all reports say the ZR is cold blooded. I was puzzled because the exhaust smelled rich but it was still running rough. So I started riding it and thought it would warm up soon. I came to a stop light and the bike died. I figured I was out of gas so I pulled into a station and filled up. I rode the rest of the way home but the bike was seriously lagging. I finally found the problem when I got home. I saw the spark plug wire dangling and the top of the plug was missing. I was only firing on three cylinders. I couldn’t figure out why they only broken one. They didn’t take them all, they didn’t scratch the paint. They just smashed the top off of one spark plug. In talking to people I found out that the ceramic top of spark plugs makes a good crack pipe. At $2.89 for a new plug it wasn’t that bad, but now I am looking for spark plug covers. Anybody know where I can get one? I have been riding cruisers for the past 7 years and thought that it was high time to venture out of my comfort zone and see what all the fuss is about with sport bikes. I saw a great deal on a low milage red ZR-7S and had to pick it up. 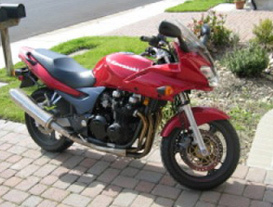 It was 7 years ago when I was sitting in the MSF classroom when a woman, one of two in the 15 person class, raised her hand and asked “Am I the only one not getting a sportbike after graduation?” One other person raised his hand, I recognized him from before the class when he got off his Goldwing. Everyone else, including me was set on riding sportbikes after getting their license. Of course the class was skewed to 18 - 22 year olds who really just wanted to learn how to do wheelies and didn’t care if their girlfriends were uncomfortable on the rear seat. At the breaks all the talk was about R1s and R6s, CBR600s and Ninjas. After all was said and done, I lucked out and found a great deal, and more importantly good sense, with a Vulcan 500. A parallel twin that you can ride all day, feet forward and lots of chrome. Well ok, a little chrome and a lot of mirrored plastic. Since then it has been all cruisers and I have been content. But if I am to truly experience motorcycle culture, I need to straddle the line between light and dark, good and evil. So I got a sport bike. I am not sure what to call it really. A sport tourer? I don’t have saddle bags yet. It is definately not a super sport with the open engine. And it is not a standard with the fairing. The name will work it’s way out as I ride it. One thing is for certain, I am glad I didn’t start out on a sport bike. Way too much power for what I didn’t know 7 years ago. I have been struggling with the differences between my V-Star and the ZR-7S over the last week. It was raining and windy the day I got it so I only got to ride 300 miles and I am trying to learn how to use it’s advantages and disadvantages to my favor in my daily commute. I keep lugging the thing. I am so used to the low end torque that I need to remember to keep the revs high. Once in the power band the thing just keeps pulling. And leaning is hard. After getting used to the threshold of scraping pegs it is hard to push past it, even though I KNOW the ZR can go further. That is just mental. It is nice to be on a thinner bike for splitting lanes but without my pipes nobody hears me coming. I have been cut off more in the last week on the ZR than I did all of last year on the Star. It is a different mentality. The ZR is about finesse and performance, the Star is about brute force and style. The one complaint I have are the bars. After about an hour my palms start to get sore. I am guessing it is a lot to do with posture. I slouch, I know it and I am trying to keep my knees tight to the tank and elbows in and back straight. That helps a lot but I get lazy and slouch. Raisers might help, but lets see what happens after I break it in. You think you have it bad in the United States . . .
Boing Boing alerted me to a video clip of traffic in India. It is interesting even though nothing happens. I watched the vehicle ballet as cars, trucks, motorcycles, pedestrians, and bicyclists pushed their way through the intersection an on with their lives. Watch the bottom-right of the clip, about a third of the way through, as a pedestrian calmly steps between a motorcycle and car to avoid getting hit. I give it up for anyone who rides in Indian cities. You must have super “spidey sense"! Trevor wrote in about moving to Californa and bringing his motorcycle. . . Thought maybe you guys could help me. I live in WV and ride a 93 seca II (xj600s). It is the non-california version. Problem is, I am movin to California this october. Can I get this bike registered ther? I read that motorcycles are smog exempt but I am a little nervous because there is a Specific california model of my bike. I would greatly appriciate any help, advice or ideas on who to ask next. First I want to say welcome to California and if you are ever in the Bay Area, I would like to ride with you. So it looks like you are good to go for two reasons, if you registered it in West Virginia and can prove you lived there, you can bring it to California, which is good for your car but you don’t need to get smog checks for motorcycles. See you on the roads Trevor. I’ve heard many non-motorcyclists make stereo-typical and condescending remarks alluding to the mentality of motorcyclists. Comments which classify riders into groups depending on what type or make of motorcycle one rides. What kind of pessimistic person would deem a “Harley” rider a ‘bad-boy, looking for a fight’ or a sport-bike rider an ‘irresponsible punk, trying to go fast’? It seems to me that most people who have never ridden a motorcycle make these types of interpretations out of fear or ignorance. While it is true that there are those motorcycle riders who DO fit the stereo-typical persona, it is also true that there are more absent-minded and oblivious drivers of gas-guzzling SUVs. I was once told that “after riding motorcycles for a while, you will become a better motorist.” I really did not believe this to be true. However, after a couple of years and several thousands of miles later, I not only understand, but also fully believe its accuracy. Without the protection of a car’s safety features and encasement from the elements, motorcyclists are forced to develop a 6th sense. Our skills are honed to recognize the difference between a driver’s absent minded swaying and one who intends to quickly switch lanes. While this skill is not inherent, it is very wide spread throughout the motorcycle community. Personally I think this is one of the biggest reasons that passing motorcyclists wave to each other; we all know what its like to be on two wheels and cut off, or worse yet have a driver switch lanes while we are right next to them. Of course dealing with these issues comes with the territory; offset by one’s personal love for motorcycles. Riding motorcycles have many advantages. Including splitting traffic (where allowed by law), extremely good fuel economy, relaxation as well as many others. I have often wondered how substantial big-city traffic jams would be reduced if 30 - 40% would just ride a motorcycle. I’m sure this would greatly impact the smog pollution as well. Maybe this could also offset the summer gas price increases. While my thoughts may go unheeded, perhaps they will give non-motorcyclists a different point of view from which they may expound their narrow-mindedness. I am an AMA member and I would recommend all motorcyclists to join, street or dirt. The AMA organization has done a lot to support and further protect us. Representing / supporting this organization can only better all of our experiences. Supporting the AMA is one way to help raise the visiblity of motorcyclists to the general public.